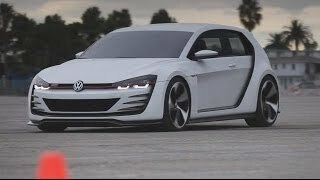 Volkswagen has unveiled the Design Vision GTI concept car, a racing version of the Volkswagen Golf GTI, at the Los Angeles Auto Show. The hot hatchback has been projected into the same league as some of the world's most celebrated supercars. Volkswagen drew the C-pillars and sills outward as autonomous body elements, thus creating space for substantially wider front and rear tracks. The radiator grille, the bottom air intake, and the brake cooling vents are combined with the headlights and framed by the front fenders and the hood. It gets specially developed 20-inch aluminum-alloy wheels. 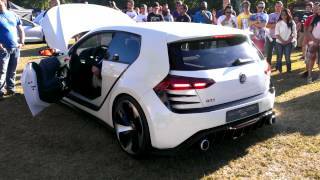 The "Design Vision GTI" looks radical because it's shorter, wider, and lower than a regular GTI. 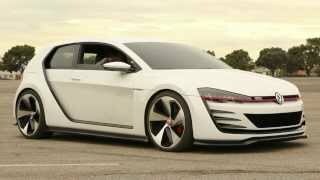 The "Design Vision GTI" applies a radical version of "reduced design". This means as few switches as necessary, so that they can be operated intuitively even while driving hard. The steering wheel is equipped with ergonomically optimized DSG paddle shifters, drive mode selector, and a start/stop switch, for example. It is powered by a twin-turbocharged 3.0-liter V-6 engine producing 503 hp and 413 lb-ft of torque. All this power and torque is distributed to the wheels via a DSG® dual-clutch automatic transmission and an all-wheel-drive system. 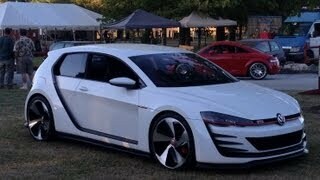 The GTI rockets from 0-62 mph in 3.9 seconds enough to match a Lamborghini Gallardo, with a top speed of 186 mph.